In response to the Trump administration handing federal climate policy over to polluters, the Conservation Voter Movement launched the Clean Energy For All campaign, marking the movement’s first-ever unified policy campaign. Our vision is one where our country runs on 100 percent clean energy by 2050, bringing all our communities closer to a pollution-free reality. This vision — one that reduces pollution, expands clean energy, creates jobs, and protects our communities from the impacts of fossil fuel reliance — is enormously popular with people all across the country: Democrats, Republicans and independents alike. People want the decision-making power to choose their energy sources, and they prefer clean energy. One component of the multi-faceted Clean Energy For All campaign has been to ask candidates — our eventual policy-makers — to commit to 100 percent clean energy by 2050. As the 2018 midterm elections approach, candidates have responded to the widespread popularity of clean energy, recognizing that it is a winning issue — in fact, clean energy candidates have emerged all over the country. 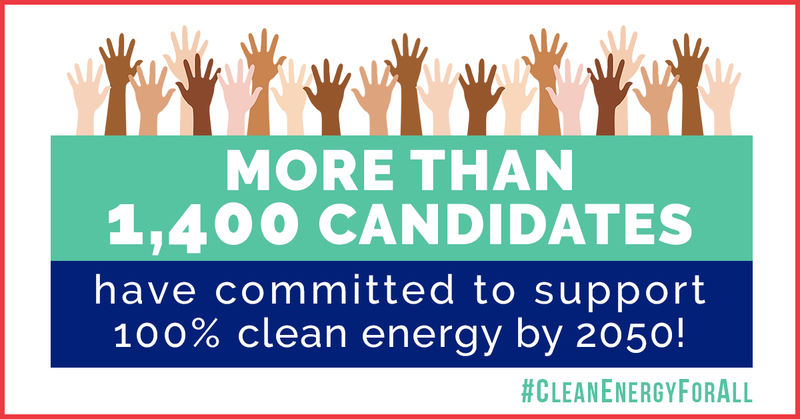 Today, the Conservation Voter Movement announced that over 1400 candidates at the federal, state, and local levels have committed to 100 percent clean energy by 2050 in the 2018 election cycle. Below are key examples of candidates from various levels of government, who are running for offices all across the country. Tony Thurmond is running for California’s superintendent of public instruction — the top schools’ official for the state. Thurmond is a current state assemblymember in California. He is a trained social worker and leader of nonprofits for youth. At every step, Thurmond has kept California’s kids as his top priority. He co-authored California’s recently passed landmark legislation SB 100, a bold measure that requires all of California electricity to be generated from clean sources by 2045. Tony has been a leader on clean energy because he believes California’s youth and students deserve a healthy future. Congressman Jared Polis is running for governor in Colorado. For the last 10 years, Congressman Polis has been a strong and passionate champion for the environment and Colorado’s way of life. He is known for standing up for what he believes in, no matter how difficult the opposition. He will work hard to safeguard Colorado’s rivers and streams, has pledged to protect Colorado’s world-class public lands and outdoor recreation economy, and has a bold plan to fight climate change and move Colorado to 100 percent renewable energy. Julie Gonzales is running for the Colorado Senate in district 34, which includes the most polluted zip code in America, 80216. She believes that every Coloradan has the right to clean air and water, which is why she supports transitioning to 100 percent clean energy by 2050. Jonathan Steinberg is running for re-election in state House District 136 and supports transitioning to 100 percent clean energy by 2050. He has been an environmental champion and ardent supporter of renewable energy for many years. In the last legislative session, he was the lead sponsor of two major energy bills that double Connecticut’s investment in clean energy and cut the state’s emissions. He also championed community shared solar, allowing homeowners and small businesses that can’t easily install solar on their roofs to still cut emissions and fight climate change. Senator Annette Taddeo is running for re-election in Senate District 40 in Miami after winning a high-profile special election just last year. In her short time in the Legislature, Taddeo has proven herself to be a strong supporter of pro-environmental policies and clean energy. During her first and only Legislative Session, she was a vocal member of the Senate Environment and Natural Resources Committee. The Miami metro area is one of the most vulnerable communities to climate change and sea-level rise, which is why Taddeo supports transitioning to 100 percent clean energy by 2050. Residents of the Sunshine State need a leader like Taddeo that will advocate for smart clean energy solutions, like solar power. JB Pritzker is the Democratic nominee for Illinois governor. Pritzker is an entrepreneur who has worked in business for decades, including as support for startup tech companies that were working on renewable energy solutions. Pritzker has committed on social media, in debates, and in questionnaires to pursue 100 percent renewable energy for Illinois by 2050 as governor. Pritzker has also committed to signing on to the U.S Climate Alliance, expanding energy efficiency investments, and investing in energy storage and electrification of our transportation sector. Pritzker is running against Governor Bruce Rauner, a one-term incumbent, who has shown strong support for coal power plants and coal mining by rolling back important environmental permits that will increase air and water pollution from coal. “As governor, I will be committed to putting Illinois on track to acquiring 25% or more of our energy from clean renewable sources by 2025 and 100% of our energy from renewable sources by 2050,” Pritzker said. Muffy Davis is running for the Idaho House in district 26A, and when her name is mentioned in the Wood River Valley, you will hear words like “leader,” “inspired,” and “fighter” not far behind. She is a world-renowned motivational speaker, gold medal Paralympian, wife, mother, and now a clean energy candidate. Davis has always pushed herself and her community to lead, inspire, and fight for what is right, which is why she is dedicated to putting her energy behind the fight for 100 percent clean energy. Muffy sees clean energy as both a solution to the problems stemming from a changing climate and as an economic bridge between Idaho’s rural and urban communities. “My vision for Idaho’s energy future includes a transition to clean energy that will allow our families to thrive, and give young people the option to find success in our local communities whether they live in urban or rural areas,” Davis said. Representative Seth Berry, who is running for re-election in Maine House District 55, is House chair of the Maine Legislature’s Joint Standing Committee on Energy, Utilities and Technology, where he works to improve Mainers’ access to affordable clean energy and high-speed internet. He is also vice president for Business Development of Kennebec River Biosciences, a Maine-owned biotech lab in Richmond, which is working to improve the health and sustainability of aquatic farms and fisheries worldwide. Berry has sponsored solar and energy efficiency legislation and has a 100 percent score from Maine Conservation Voters. For his policy work, Berry has received the Northeast Clean Energy Council’s 2017 Maine Clean Energy Champion Award, the the Maine Development Foundation’s 2014 President’s award for leadership on jobs and workforce measures, the 2014 Maine Children’s Alliance “Giraffe” Award, which is given to those who “stick their necks out for kids,” the the Maine Alliance to Prevent Substance Abuse’s 2011 Prevention Award, the Maine Lung Association’s 2007 Clean Air Award, and others. Delegate Cheryl D. Glenn is running for re-election as a state delegate in the 45th Legislative District. Glenn was born and raised in Baltimore City. She was a personal officer for the Baltimore City Public School system for 18 years when she organized and founded the City Union of Baltimore, Local 800, AFT, AFL-CIO. This union represented 8,000 city employees, with more than 500 different classifications, from unskilled workers to those with doctorate degrees. Glenn served three consecutive terms as the first president of the City Union of Baltimore. In 2006, Glenn was elected to the Maryland House of Delegates, where she is currently serving her third term as a state delegate in the 45th Legislative District. Glenn is the co-chair of the Joint Oversight Unemployment Insurance Committee; the vice chair of the Worker’s Compensation Subcommittee; and the chair of the Legislative Black Caucus of Maryland. The Daily Record chose Glenn to be one of eight in their “Elite 8, Ones to Watch in the 2017 Legislative Session.” Maryland Matters chose Glenn as one of “10 to Watch in the 2018 Legislative Session.” Glenn is proud to say that she is a champion of working men and women. “I am proud to sponsor Maryland’s effort to expand our commitment to renewable energy, because I know that it will bring good, supporting jobs to the hard-hatted women and men who install and maintain these systems, while improving air quality in some of the most environmentally degraded areas of the state. As an African-American legislator who cares deeply about the environment and social justice, I cannot and will not hesitate to push our state to lead the nation in renewable energy production and use, so we can together reach the goal of Clean Energy For All,” Glenn said. Mallory McMorrow is running for the Michigan Senate in district 13, and she is in love with the great natural beauty of Michigan, which is why she supports transitioning to 100 percent clean energy. The state’s sprawling Great Lakes and green forests inspired her choice to make Michigan her home after working in design, media and advertising in New York and Los Angeles. Now, she is committed to bringing the complex problem solving skills she learned as a designer to the Michigan Senate where she is committed to working towards a more diversified mix of energy sources to mitigate climate change, improve overall sustainability, and decrease costs for consumers. Gretchen Whitmer is a former state senator running for Governor of Michigan. Whitmer has a record of bringing people together to solve tough problems. She helped negotiate the Healthy Michigan Medicaid expansion, which expanded health care to 680,000 working Michiganders; brought workers, labor unions, and businesses together to fight anti-worker legislation; implemented stronger ethics standards and established a new Domestic Violence Unit during her time as Ingham County Prosecutor. Whitmer believes Michigan needs to act now on climate change, which is why she supports transitioning to 100 percent clean energy. Whitmer will also work to protect Michiganders clean water for the sake of their health, the economy, and the nearly 1 million jobs in fishing, farming, and tourism that are anchored on the Great Lakes. Amanda Bogner is running for the Omaha Public Power District Board of Directors. As a mechanical engineer and small business owner, Bogner has helped companies make smart energy decisions that lower costs and improve business efficiency. Bogner is LEED accredited and founded the Nebraska Flatwater chapter of the U.S. Green Building Council, and she supports 100 percent clean energy by 2050. Previously, she was the manager of simulations at a nationally recognized sustainability consulting firm, where she was responsible for providing her clients meaningful energy modeling analysis. As an alumna of the Omaha Chamber’s Leadership Program, Bogner has built partnerships across business, government, and nonprofit organizations. As a member of her church, library volunteer, and board member of several community organizations, she understands the needs of her community, especially the importance of affordable, reliable electricity. Micaela Cadena is running for the New Mexico House of Representatives in House District 33. Cadena is a young progressive who has spent most of her career working as an advocate for women and people of color with Young Women United. Her approach to renewable energy and conservation is deeply driven by community, and she supports transitioning to 100 percent clean energy by 2050 because she sees it as an opportunity to create good jobs and boost the economy of southern New Mexico. Sydney Batch is running for North Carolina’s House District 37. Batch is a lawyer, social worker, and child welfare advocate, who believes every person deserves to breathe clean air and have safe, drinkable water, which is why she supports transitioning to 100 percent clean energy by 2050. She believes that citizens should be able to purchase clean and renewable energies, such as wind and solar from third parties; that tax credits should be provided to those companies and families that invest in renewable energies; and that companies should be required to bear all of the burdens for cleaning up the environmental disasters they have caused in a timely, efficient, and cost-effective manner. Erica McAdoo is a candidate for North Carolina House District 63, which is located in rural Alamance County between Chapel Hill and Greensboro. A large part of McAdoo’s work managing a law firm involves strategic planning, and she believes investing in clean energy is a smart strategic move for North Carolina’s future. She knows our children deserve air they can breathe and water they can drink, and an economy which offers good-paying, green jobs. That means moving on from dirty fossil fuels and embracing the clean energy technology that is already a huge part of North Carolina’s economy. Casey Weinstein is the Democratic nominee for Ohio House District 37. Weinstein is an Air Force veteran, Hudson city councilman, and business leader with a personal stake in creating a cleaner environment for all Ohioans. Weinstein was driven to run for office due to his daughter’s severe childhood asthma, which was exacerbated by the Cleveland-Akron area’s poor air quality — the 10th worst in the nation. Weinstein has spearheaded local efforts to push solar, from fundraising for solar panels on the Barlow Community Center as a private citizen to investing in utility-scale solar power as a Hudson city councilman. In his campaign for state representative, Weinstein has prioritized easing wind setback laws and empowering growth in the clean energy sector to create the jobs of tomorrow. Oregon Governor Kate Brown, who is running for re-election, signed the nation’s first “coal-to-clean” law to completely phase out dirty coal power by 2030 and double Oregon’s reliance on renewable energy by 2040. She knows that climate change threatens Oregon’s economy, landscape, and way of life. She believes Oregon should transition to using 100 percent clean energy to reduce greenhouse gas emissions and grow the economy by pioneering clean energy technologies. Chris Rabb is running for re-election in Pennsylvania House District 200. In his first term in the state House, Rabb sponsored important legislation to achieve 100 percent clean energy by 2050, a bold action from a new legislator in a state long dominated by fossil fuel interests. As a champion of environmental justice, Rabb fights to ensure that new housing built for low- and moderate-income families is energy efficient. Rabb is a founding member of the Pennsylvania Climate Caucus and serves as treasurer of the Pennsylvania Legislative Black Caucus. James Smith is the Democratic candidate for governor in South Carolina. At every stage of his career over the last two decades, state Representative Smith has exemplified what it means to be a clean energy champion, and as a gubernatorial candidate, Smith has made clean energy a core part of his campaign by committing to 100 percent clean energy by 2050. In 2014, Smith was critical in passing Act 236, which brought net-metering to South Carolina and ignited a wave of solar growth across the state. After the collapse of a nuclear project in 2018, he led a bipartisan charge to bring more accountability to energy decision-making and start a clean energy revolution in South Carolina. Because of his clean energy leadership in the statehouse, Smith earned the highest score on Conservation Voters South Carolina’s 2017–18 conservation scorecard. Smith’s entire career has been dedicated to service to others in his community, state, and nation. Today, he is a major in the South Carolina Army National Guard, a small business owner, and practicing attorney in Columbia, South Carolina. For his service, Smith was recognized with the Bronze Star, the Combat Infantryman’s Badge, and the Purple Heart. Christine Hallquist, Vermont’s Democratic nominee for governor, supports the state’s goal of achieving 90 percent renewable energy by 2050 for all electricity, heating and transportation needs. Hallquist is a former utility executive, so she has a strong understanding of climate and energy issues, and sees opportunities for transitioning to clean, local energy sources without raising energy costs. She is highlighting the need for climate action as a top-tier campaign issue, and as the nation’s first transgender major party candidate for governor, Hallquist is highlighting the need to simultaneously address issues of social, economic, and environmental justice. Senator Rebecca Saldaña is a progressive leader with decades of experience fighting for economic, social, and racial justice. First elected in November 2017, Saldaña is running for re-election in 2018 in Legislative District 37. Saldaña is committed to support 100 percent renewable and clean energy for Washington, which is a key part of the state’s work to lead in proactive climate policy. Saldaña is on the Senate Democratic Leadership team, serving as caucus whip and vice chair of the Senate Transportation Committee. She also sits on the Labor & Commerce Committee and the State Government, Tribal Relations & Elections Committee. Mandela Barnes is running as for lieutenant governor on the Democratic ticket with Tony Evers. A Milwaukee native, he was born in the city’s poorest and the nation’s most incarcerated zip code. At age 25, Mandela was elected to the state Assembly where he emerged as a champion on issues of the economy, criminal justice reform, and the environment. He became the chair of the legislature’s Black and Latino Caucus in his first term and was recognized as one of the top pro-growth progressive leaders in the country. He earned a 100 percent pro-conservation voting record during both of his terms in the state Assembly. He has been a champion of investing in renewable energy projects and green job training programs. “We must invest in renewable energy here in Wisconsin — it’s the fastest-growing sector of the economy. Investment in clean energy and green infrastructure and green jobs is the most pro-active and effective way to combat climate change,” Barnes said.